I remember watching the movie Apollo 13 on the big screen way back in 1996 and being pretty amazed by it. I knew the movie was based on the true events of the failed Apollo 13 mission, but it wasn't until I recently discovered Lost Moon at my local library that I realized it was actually based upon a book by Jim Lovell, one of the Apollo 13 astronauts who lived to tell the tale. Even as a sixteen year old high school student, I recognized Apollo 13 was a well-made movie, but I had no idea just how dedicated Ron Howard was to creating a technically accurate and realistic movie. Howard went to great lengths to replicate the Apollo 13 Command and Lunar modules, the astronauts' spacesuits, and NASA's Mission Control. The cast underwent astronaut and flight controller training from NASA technicians. The actors actually filmed the space scenes in a reduced-gravity parabolic plane (also known as "the vomit comet") in 25 second intervals of weightlessness, the same method that NASA uses to test equipment and train astronauts for space flight. 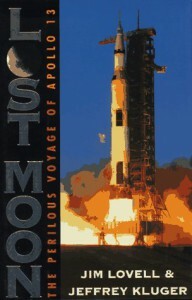 Ron Howard was determined to make the words of Lovell's book come to life on the movie screen and he did it with smashing success.